Thank you to all our band students for participating in the solo/ensemble festival! Check out new information regarding the Band trip to New York City in January 2020 here. Schedules for the Band Program are available online. Look here for schedules for SHS, SIS and the Elementary Schools. Thanks for supporting Shorewood Bands!! 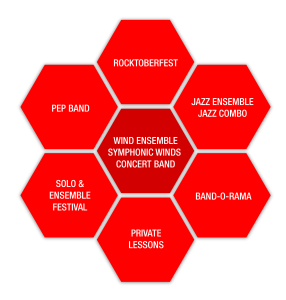 Shorewood School District has a vibrant Band Program with a variety of offerings for Elementary School, Intermediate School, and High School bands. Support the Shorewood Band community through a Notables Donation. Join your neighbors as Notable Band Friends. Your generosity provides funding for program enrichment. Please use the button below to go to our donation page. There are many volunteer opportunities to help Shorewood Bands. Please contact the SBPA Co-Presidents, Anjum Alden or Kim MacKowski at shorewoodbandparentassn@gmail.com to find out more or with any questions or comments.